On Sale Now! Save 2% on the MasterVision MA2700790 Earth Easy-Clean Dry Erase Board, 48 x 72, Aluminum Frame by BVC 1.6 at PPC Think. MPN: BVCMA2700790. Hurry! Limited time offer. Offer valid only while supplies last. Made from recycled and recyclable materials, magnetic porcelain Platinum Pure WhiteTM dry erase boards provide high-quality professional performance. 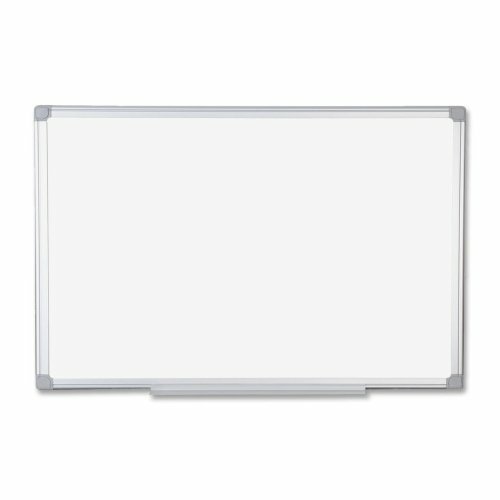 Made from recycled and recyclable materials, magnetic porcelain Platinum Pure WhiteTM dry erase boards provide high-quality professional performance. Ghost- and scratch-resistant surface is suitable for extensive use. Sturdy aluminum frame features the four-corner system for easy vertical or horizontal mounting. Sold as 1 EA. Ghost- and scratch-resistant magnetic porcelain Platinum Pure WhiteTM dry erase surface is . Sturdy aluminum frame with easy four-corner mounting system. Snap on pen tray and mounting hardware included. Certified to Silver Cradle to Cradle 3.0 Standards. View More In Easel-Style Dry Erase Boards. If you have any questions about this product by BVC 1.6, contact us by completing and submitting the form below. If you are looking for a specif part number, please include it with your message.